Access the 2019 agenda and faculty here. 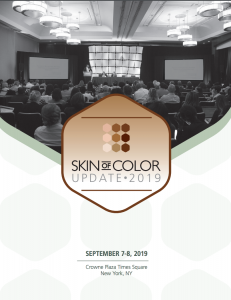 Download the Skin of Color Update 2019 (formerly Skin of Color Seminar Series) brochure and save the date below. Creighton University Health Sciences Continuing Education designates this live activity for a maximum of 12 AMA PRA Category 1 Credit(s) TM. Physicians should claim only credit commensurate with the extent of their participation in the activity. AAPA accepts AMA category 1 credit for the PRA from organizations accredited by ACCME. Creighton University Health Sciences Continuing Education designates this activity for 12 contact hours for nurses. Nurses should claim only credit commensurate with the extent of their participation in the activity. In support of improving patient care, this activity has been planned and implemented by Creighton University Health Sciences Continuing Education and Physicians Continuing Education Corporation. Creighton University Health Sciences Continuing Education (HSCE) is jointly accredited by the Accreditation Council for Continuing Medical Education (ACCME), the Accreditation Council for Pharmacy Education (ACPE), and the American Nurses Credentialing Center (ANCC), to provide continuing education for the healthcare team. 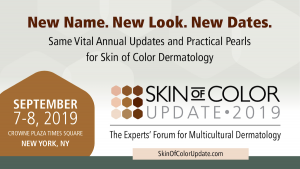 © 2019 Skin of Color Update Dermatology Conference New York City. ©Sanovaworks. All Rights Reserved.